Sometimes you might end up bringing whole coffee beans in lieu of pre-grounded coffee and might leave you perplexed thinking that maybe you would not know what to do with them. For this purpose, you do not need to buy a coffee grinder to solve the purpose. In fact, you can grind coffee beans without the use of a coffee grinder and we will teach you how to do that in this article. Blenders work great for the purpose of coffee grinding. It is not just great for making shakes and smoothies but also works amazingly as a decent medium based coffee grinder. Try adding some amount of coffee beans in them and grind them at a consistent speed. Once you feel they have been grounded well, add more servings to grind up. Don’t end up throwing almost half a bag of coffee beans in the blender, or else the blades inside them could gunk up with the chunks of beans in it. This is a longer method and could take up some time but the end results are effective. However, when you grind your coffee beans with a mortar or a pestle, ensure that you filter out the unwanted dust from the coffee grounds. Ideally, for one cup of coffee, you will require two tablespoons of coffee grounds to brew, so make sure that you fit only that amount in the mortar and not fill it up with a lot of it all at once. Stir them when you feel that the beans have been grounded well. Put the required coffee beans in a plastic freezer bag and then cover it with a towel. You might not get the best coffee grounds by hammering the beans but nevertheless, they would not be too coarse. It also depends on the type of hammer you use for the purpose. However, avoid using a sledgehammer for it. Make sure that you hammer all the beans evenly and avoid destroying the coffee beans in the name of grinding. 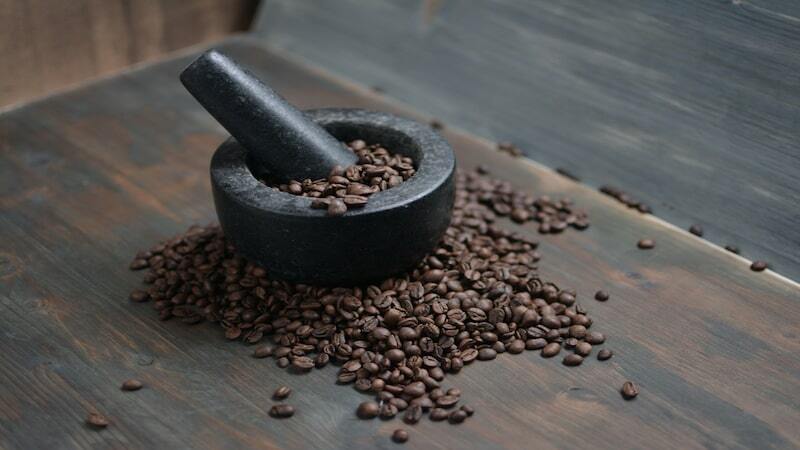 It does not matter if you use a wooden roll or a marble one which is heavier than the standard wooden roll, or even a stainless steel rolling pin, the focus should be at getting the coffee beans grounded right. The coffee grounds with a rolling pin will be a lot more even than the grounds you will get with a hammer. Measure the number of coffee beans you will need for the purpose and then put them in a plastic freezer bag and seal the bag well and then slowly start rolling the rolling pin on one side. Hand mincer or grinders are metallic pencil sharpeners kind of kitchen device used to cut meat and vegetables. So you can understand now why it is used for the process of grinding coffee beans. The internal blades inside it are good enough to chop or grind whatever you put inside it, even if it be coffee beans. However, always make sure to measure the number of coffee grounds you put inside the hand mincer so that you do not crank up the device. It is okay if you do not have all the resources to grind coffee but you could get a lot more creative with coffee grinding process. Even if you have minimal resources in your kitchen, make good use of them. Now you know, it is okay if you do not have a coffee grinder in your kitchen, you can still grind your coffee beans with these tools to continue enjoying your coffee cups daily, without burning a hole in your pocket.